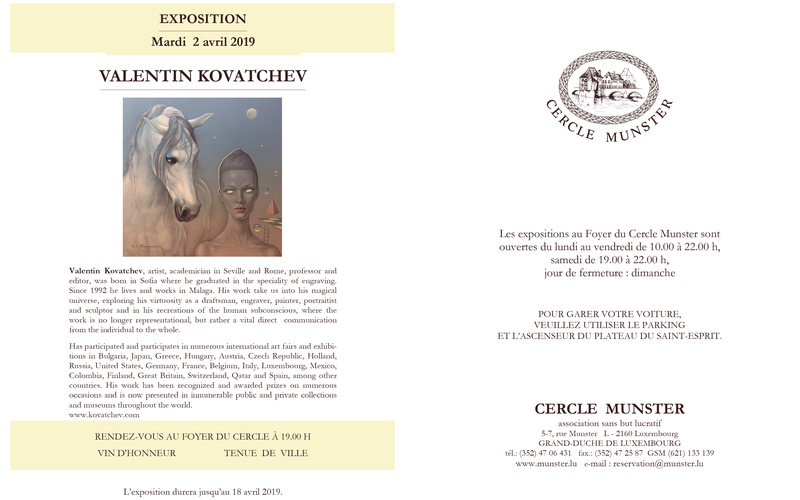 The exhibition “Mistica” by the Bulgarian artist Valentin Kovatchev will soon arrive at the Cercle Munster in Luxembourg. Displayed with great success already in Madrid, Malaga, and in Seville where it is still running, the travelling exhibition is organised by the Embassy of the Republic of Bulgaria in Spain as a part of the cultural events commemorating the first Bulgarian Presidency of the Council of the European Union that the country held in the first semester of 2018. As explained in the invitation, Mistica will allow all those who visit it to tap into the magical universe of this exceptional artist; exploring his virtuosity as an engraver, painter, portraitist and sculptor, as well as his recreations of the human subconscious, where the work is no longer representational, but rather a vital direct communication from the individual to the whole. Starting on 2 April, with the vernissage held on the same evening, the show will be opened until 18 April. This will be the first solo exhibition of the artist in the Grand Duchy, as he previously has participated in the Luxembourg Art Fair of Contemporary Art, among other local exhibitions. Especially for this event, Valentin will present many new works, four of which are now under preparation. Among them is Sibyl VI, from the series that last year in Brussels, in the Brigit Art Gallery, Rue Rollebeck 36, Sablon, in Brussels gained huge admirations of the public. Indeed, he keeps in this gallery permanent collection. In Luxembourg, Kovatchev will also display some pieces of Tavromagia, Dama del Caballo, Flautist in blue, Horses and Daydreams. Kovatchev again emphasises on the didactic aspect of his exhibitions by arranging personally guided visits, and with the display of some zinc matrix plates of his extraordinary etchings. Why is the show titled Mistica? It is an idea of Kovatchev’s wife Rosario Escobar – “the muse of my dreams”, as he describes her. Besides the full-time job “muse”, Rosario, or Charo, is arranging her husband’s participations in exhibitions and art fairs, in publishing catalogues, making contacts and marketing. The artist is living in Malaga for 27 years now and his style in a unique way weaves together elements of Bulgarian and Spanish spirit, sensitivity and culture. “Painting, creating art works, is mystic itself,” Kovatchev explains, saying that his paintings also contain mystical traces and marks. I never sit down to paint using sketches. The drawing or painting subject comes up in the course of work, he stressed. “A lot of people ask me why there are so many ladders in my paintings, they in fact have a new dimension – this is the link between our life and the ulterior. It is also metaphysical look towards the existence. I find inspiration as well in the works of the famous Giorgio de Chirico,” the Bulgarian artist underlined. Kovatchev’s work has been recognised and awarded on numerous occasions and is represented in countless public collections, private and museums around the world. He studied the technique of engraving at the Art School and then at the Art Academy in Sofia, but after years of practice and endeavours he invented his own etching technique, which became his art emblem.